On June 12, Bridge Communities proudly presented the second edition of A Chair Affair, a unique opportunity to appreciate and celebrate beautiful artwork through the transformation of chairs, stools and benches. 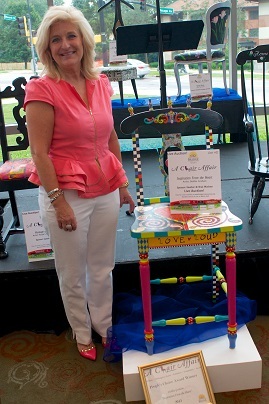 From May 21 to June 11, 2015, chairs were on display at retail locations in Downtown Naperville, where the community was encouraged to visit, view and vote for these fun, whimsical, funky and avant-garde chairs. All proceeds from the event directly support homeless families in DuPage County in the Bridge Communities Transitional Housing Program. Thank you for joining us and helping us change lives! Want to see more photos from A Chair Affair? Visit our album on Facebook! For information on how to become an Artist or Sponsor for the 3rd Annual A Chair Affair please contact Chad Pedigo at (630) 545-0610 ext. 19.